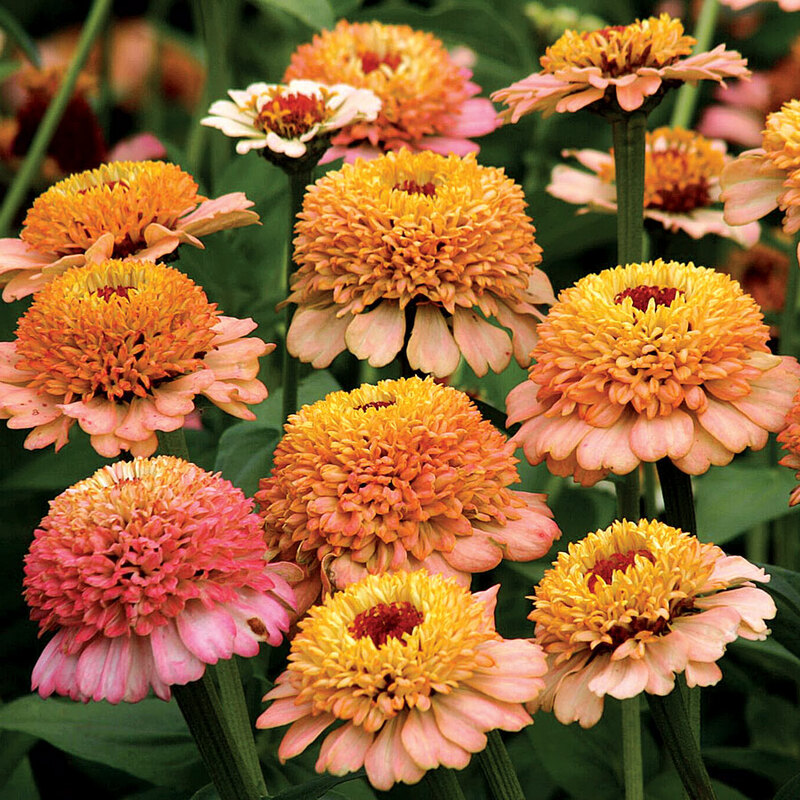 With fall just around the corner, leaf drops will be here soon and so will yard cleanup and that familiar sound of the leaf blower. When it comes to leaf blowers, the first thought that usually comes to mind is how irritating they can be. In fact, the majority of blowers that people are familiar with are the ones that are noisy enough to disturb the neighbors. 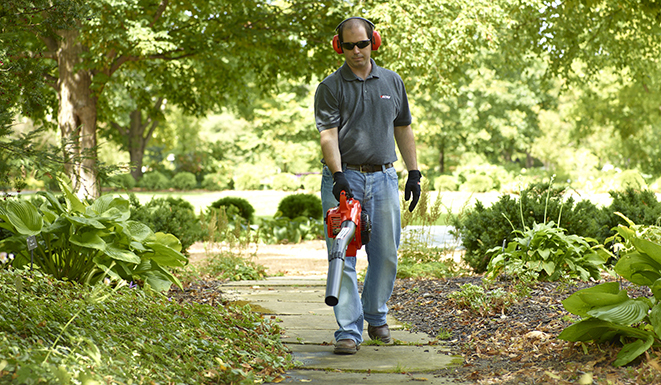 In reality, there are “quiet” leaf blowers, or low noise blowers available that resolve this issue. Concerts – these measures anywhere from 135 to 145 decibels. Anyone who has been to a concert lasting several hours knows that when they leave, ambient sounds appear to be slightly muffled. So we know firsthand that prolonged exposure can impact our hearing. This is why when at concerts, gun ranges, and shuttle launches hearing protection is recommended. 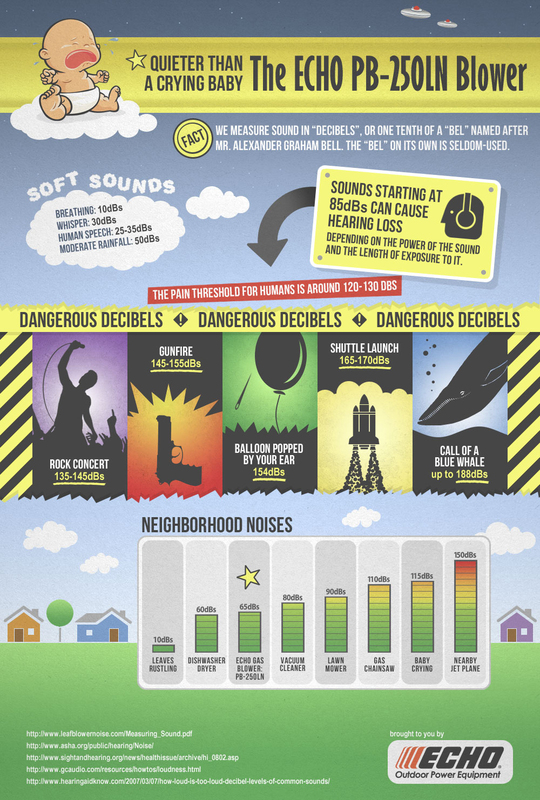 So knowing all this, where does the low noise, gas powered blower fall in terms of decibels? Measured at 50 feet, the ECHO PB-250LN is a mere 65 dB(A). The level of decibels this ECHO blower puts out at the operator’s ear falls well below the range of our examples. It is welcomed in neighborhoods and communities that have complained about leaf blower noise or are considering a leaf blower ban because a low noise blower is around 75% quieter than a traditional blower. Where do electric blowers fall in the noise spectrum? While the noise level may be reduced on some electric designs, it is not reduced on all. Most still generate a high-pitched scream that sounds very much like a shop vacuum. Corded electric blowers can’t match the power obtained from a gasoline-powered blower. Another serious drawback is that these blowers are attached to stationary power outlets by an electrical cord which limits where the user can go. The battery-powered blowers on the market may not scream, but typically performance and run time are sacrificed for the sake of less noise. When it is time to determine the best solution for any leaf blower need, a low noise blower is the ideal addition to your inventory of lawn care tools. ECHO makes more low noise blowers than any manufacturer. 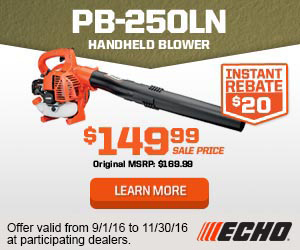 During ECHO’s National Sales Event starting September 1, you can buy the PB-250LN handheld blower for $149.99 at participating dealers. Visit www.echo-usa.com to learn more.